Vimeo announces September’s slate of Staff Pick Premieres, with a different film making its global online premiere each Wednesday on Vimeo. To check out the Staff Pick Premieres channel, visit https://vimeo.com/channels/premieres. This month’s slate includes titles such as “Rubber Heart,” Lizzy Sandford’s story of a one night stand and the effects it has on a woman; Mounia Akl’s “Submarine,” a story set in a twisted near future about an abominable garbage crisis and a heroine who refuses to leave town; Mark Ram’s “Balance” which tells the gripping story of two friends and a rock climbing excursion gone terribly awry; and Charlotte Scott-Wilson’s “Hold On,” the story of a young cellist with crippling stage fright and what she must overcome to stay in her orchestra. Synopsis: After a painful dry spell a woman attempts to have a one night stand. When her grown out pubic hair is met with awkward reception, Anna loses her confidence and to some extent - access to her own intimacy. This film explores the choices we make for our bodies, and for whom those choices are made. About the filmmaker: Lizzy is a filmmaker living in Los Angeles. She studied intellectual property at NYU's Gallatin school and worked in the music industry before finding filmmaking. Her first short film, Palisade, won best short at Evolution Mallorca festival in 2015. Her second, Hip Hip Hooray premiered at SXSW and also earned a Vimeo Staff Pick. Her third Rubber Heart premiered at Sundance followed by SXSW. Lizzy is vegan for climate change. Synopsis: “Submarine” is set in a twisted near future in Lebanon where Beirut is still dealing with the abominable garbage crisis that started in 2015. There are now terrible health threats, and acid rain triggers a town’s evacuation. While everyone is packing up to go, Hala refuses to leave, but she doesn’t want to be left alone either. We follow our heroine as she desperately tries to caulk and stop the cracks in her apartment, in her sentimental life, and possibly, those tearing the Lebanese society apart. 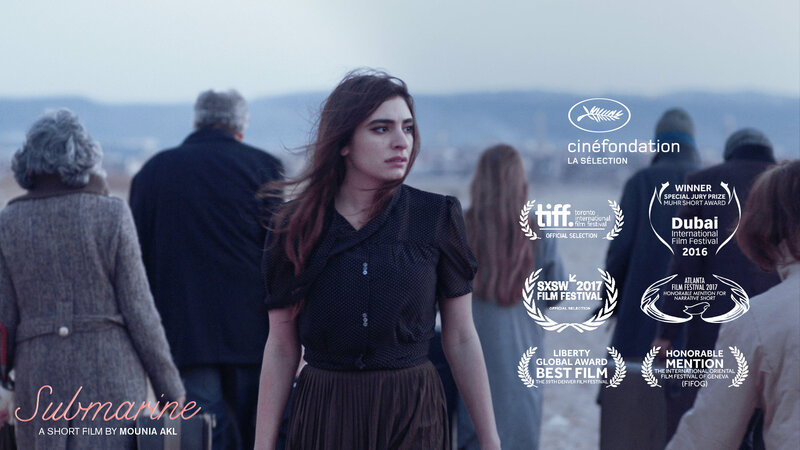 "Submarine", was in the official selection of the 69th Cannes Film Festival, South By Southwest, Toronto International Film Festival and Dubai International Film Festival where it won the Muhr Jury Prize (Amongst others). Submarine was shortlisted for the Student Baftas and was awarded the James Bridges production grant and the Kodak Motion Picture Product Grant . About the filmmaker: Mounia Akl is a director and screenwriter from Lebanon living between Beirut and New York. She holds a bachelor’s degree in architecture from ALBA and an MFA in Directing from Columbia University. She is the recipient of the Vimeo-sponsored Best Directors Award at the 2016 Columbia University Film Festival. Apart from directing, Mounia has taught film directing at the NHSI at Northwestern University, Chicago and was a preceptor in Screenwriting at Columbia University, New York where she was also Richard Peña's teaching assistant. Synopsis: Friends Henderson and Morris are climbing a mountain, connected by a rope. They take an easy passage, but a loss of oversight leads to Henderson's fall. Morris cannot prevent falling too. Seconds later he finds himself hanging above an abyss, realizing the balance is unstable. About the filmmaker: Mark Ram started his career as a young actor on Dutch television in the 1990s with the television series The Partisans. The series was awarded a Golden Calf for best television drama. In the same period he also appeared as one of the main characters in the Dutch television series Unit 13. The series ran for three seasons. Synopsis: A fiction film about a young cellist who has to overcome her fears to keep her position in an orchestra. Inspiration for the film are the true stories of classical musicians dealing with performance anxiety which has lead to addiction. Research has also proven that that 30% of all musicians use Beta Blockers to calm their nerves. Something everybody knows, but nobody is talking about. “Hold On” seeks to strike a blow in the industry and hope people will stop being afraid of their feelings instead of numbing them and might even start talking about them. About the filmmaker: Director and screenwriter Charlotte Scott-Wilson was born in Scotland and is a Dutch Film Academy graduate. Charlotte has a deep love for visual storytelling. She wants to reach a wide audience with her films and explores confronting themes in an accessible way. Never compromising to make her films cutting and visceral in a way we haven’t seen before. Her first short film “Forever After” premiered at the Oscar qualifying Palm Springs Festival 2013. “Hold On” premiered at the Tribeca Film Festival and won best narrative short. Vimeo’s popular Staff Picks channel is curated by a five-person team that highlights the best short-form content on the platform.